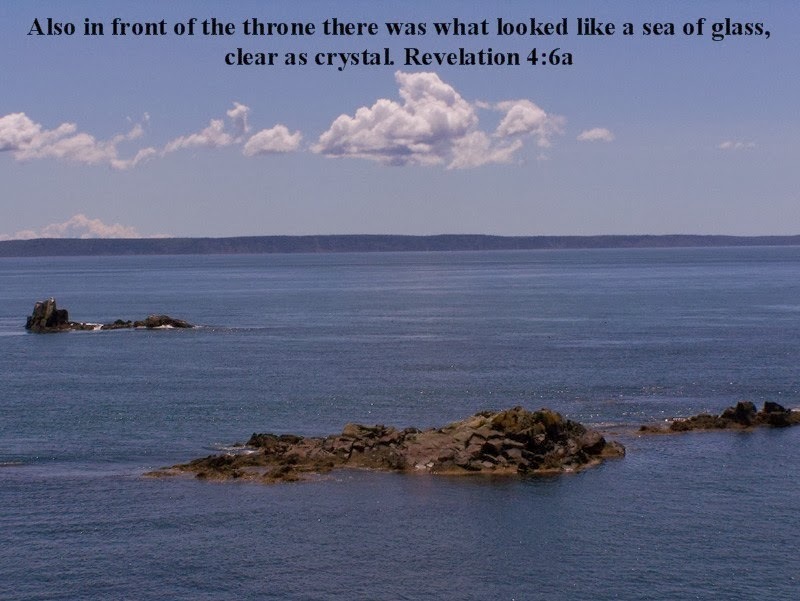 This picture was taken in Lubec Harbor, easternmost point in the US and next to New Brunswick Canada. The waters are part of the Bay of Fundy, known for having the highest tidal range in the world. A large volume of water has to rush in and out within a few hours. The more water that needs to come in, the more it roils. When the tide comes in, the roiling starts abruptly and for a while it almost looks like it's boiling. The weather in northern Maine and Canada is rough, too, with constant wind and storm. This picture was taken because it is unusual to see such calm waters in this area of the world. Calm mid-tide, no storm, no fog, no wind. The world isn't calm now, not for more than mere moments in a few places, sometimes. There will come a day when the sea will be glassy always, and hearts will be calm. We will fully know peace.